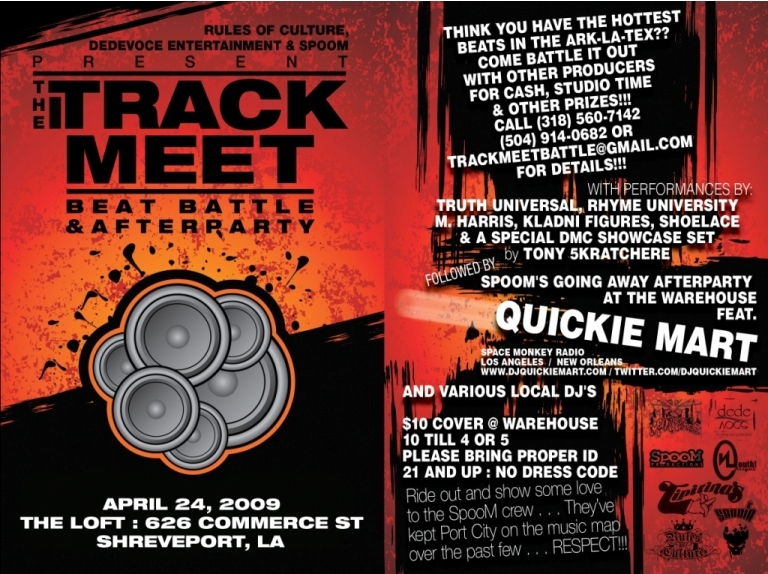 •The Track Meet • A new Shreveport Beat Battle, Showcase & Networking Party! The Track Meet is the first ever beat battle in the area and will be held at The Loft / The Warehouse in downtown Shreveport, April 24th @ 8 pm. The first part of the evening will feature a producer competition (beat battle) to crown the ‘King of the Beats’ of the Ark-La-Tex area. Prizes are as follows: 1st – $250, 2nd – $150 & 3rd – $50. There will be a networking after party once the competition is finished with performances by: Truth Universal (New Orleans), Rhyme University (Texas), M. Harris (New Iberia), Kladni Figures (Shreveport, Jackson) & Shoelace (Baton Rouge). There will also be a DMC turntablism showcase by Tony Skratchere (New Iberia), who is the DMC New Orleans representative. Come out and support your locals and help crown the first King of the Beat!!! Admission is $5 to the battle, $10 to the afterparty. ~ by Voltima on April 6, 2010.